The danish designer Christina Rohde combines Nordic purism, urban style with a girlish playfulness at the eponymous label. The style of Christina Rhode is far away from stereotypes and defined by an expressive and thoughtful collection. Luna Journal spoke with designer Christina Rohde about the S / S 17 collection and her position as a pioneer in children’s fashion. How has the reaction been on the S/S 17 Collection so far? Christina Rohde: We just got back from the Playtime in Paris. It’s always a pleasure to be there. The reaction towards the summer 2017 collection has been so good. They really like the light colors and the prints. How would describe the look of the S/S 17 Collection and what inspired you to this collection? Christina Rohde: The idea with the SS17 collection was to make an “easy going” collection. The collection is called “A Summers Tale” and the song by Ella Fitzgerald “Summertime, and the livin’ ie easy” has been an inspiration from day one. Your shootings are know as very artistically and unseen. How did the idea for the S/S 17 shooting in the supermarket came up? Christina Rohde: Ever since I started working with my daughter, photographer Olivia Mikka Rohde, the images has just getting better and better. She is a very talented person with many brilliant ideas. The story behind the SS17 campaign-images was to reflect a summer holiday. What would you do if you had a few days of: Eat pastel colored ICE cream, go on dreamy trips into nature, picking flowers, go horseback riding, go to the beach and of course go to the supermarket for great food and spend many hours making family dinner. Are you playing with contrasts when designing and what do you think about classic girls fashion and stereotypes? Christina Rohde: I love contrasts in fashion. I love mixing a sweat pants with a silver embroidered top. There is a room for everybody, for classic girls and any stereotypes. But most of all, I like individualism. That’s the reason, why I involve for every campaign shooting a young girl in the age of 13-15 years, to do the styling together with me. The girls are always surprising me with “strange” combinations, which are actually really cool. 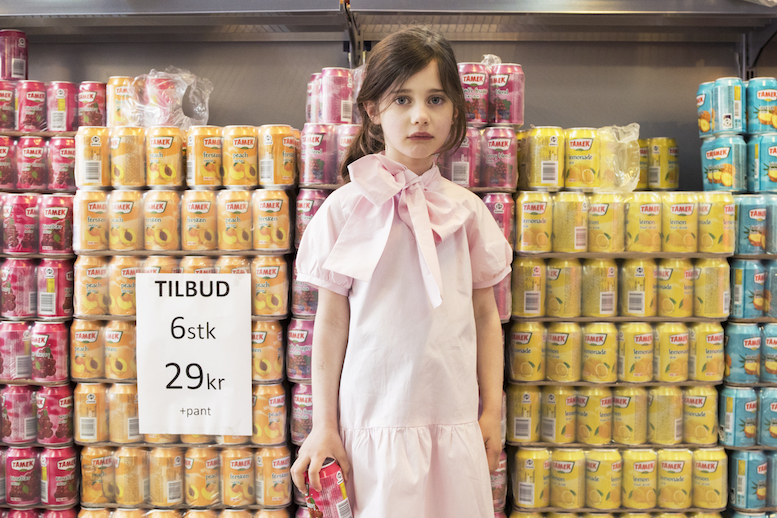 What makes you to a pioneer in the Scandinavian children’s fashion? Christina Rohde: I was the first in Denmark who made children’s fashion, when I started back in 1991. The girls of your campaigns act as tough and strongly characterised girls. Is that your audience or which type of girl is Christina Rohde customer? Christina Rohde: I hope that any kind of girl is my customer, but when we cast the girls – my photo team and I – we always go for strong characters. We don’t look for beauty, just attitude. Your fashion would be absolutely adult compatible. Would a women’s line be conceivable? Christina Rohde: Yes, definitely. For this winter we started making some of the styles in women size. And we will make more for the upcoming seasons.